↑ It is the population of the whole island; Cockburn Town & Hawks Nest only has 133 people. ↑ "Census: Population Breakdown". fptci.com. FP Turks & Caicos. 9 August 2012. Retrieved 28 May 2013. ↑ "Guinep House". 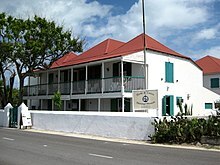 Turks & Caicos National Museum. Retrieved 28 May 2013. ↑ "Botanical Garden". Turks & Caicos National Museum. Retrieved 28 May 2013. ↑ "Project: Message in a Bottle". Turks & Caicos National Museum. Retrieved 28 May 2013. Wikimedia Commons has media related to Cockburn Town. This page was last changed on 10 January 2019, at 10:50.